My lack of blogging has nothing to do with having little to write about, rather too much to write about! As an avid social media user, I find terrific, challenging, mind-blowing, thought-provoking articles written by people so much smarter than me every day, and if I had all the time in the world, after spending the time needed to thoroughly digest these words of wisdom, I would ideally be able to craft a reflective response. There is just so much great stuff out there that I am mulling over – everything I’m reading and making connections makes it difficult to even begin putting together my own thoughts on these coherently. So instead, let me direct you to some things I’ve read that are occupying my thoughts lately. Being An Ally Versus Being a Nice Person by Nadirah Adeye on Patheos. You can probably see from these links that much of what I’m really thinking about lately has to do with race, privilege, and what allyship is really about. To end, I’m linking a video that a friend showed me this morning highlighting all the ways one can think they are being an ally but really are not. I just wanted to publicly thank Relando Thompkins, one of my favorite bloggers, for including me in his 13 Compelling Social Work Blogs post. Relando’s blog, Notes from an Aspiring Humanitarian is a lovely blog full of inspirational and thoughtful posts about social work, society, culture, working for social justice and peace. Relando and I share a passion for improving the experience of students of color in higher education. Always thoughtful and thought-provoking, please add N.A.H. to your blog roll! In my first year of my doctoral program I was fortunate to meet a colleague who had as much online/social media experience as me – few of my fellow social work colleagues and faculty in our school used (even now) online social media much beyond LinkedIn for professional contacts and maybe Facebook for personal connections – forget about blogging, Tumblr, Twitter or the like. When I began graduate school my department did not use social media sites to promote and market their activities and programs. I asked if I could create and maintain a Twitter site for the Center and now I share Twitter duties with other graduate students. I enjoy working with others in the Center to think about how to effectively use social media to promote the Center’s activities. One of the things I make sure to emphasize when I talk about using Twitter or other social media (our Center also has a Facebook page and a blog) is the reciprocal nature of social media. A lot of professionals use Twitter and Facebook in a one-way direction to share their organization’s (or professional) activities/news/etc. But I often remind others who are starting to use Twitter professionally that it’s not just about a mass news blast to the “Twitterverse” but that social media done best is done relationally. That means paying attention to who else is out there that is similar to you or your organization and “following” or “liking” their social media page. It means thanking new followers on Twitter for following you. It means when someone you follow or like posts, a news story link or message that you “re-tweet” or “share” rather than posting it as your own. It means commenting on other blogs and linking other blogs on your blog as well. It means making connections between fellow online relationships that you think would benefit from knowing each other.To me this is what social work is all about! Anyone who knows me knows that one of my mantras in almost all social work (and beyond) situations is parallel processing. So in the same ways that we social workers tend to think about social media as a client (practice) issue, I want to encourage our profession to see it as a professional and organizational issue as well, beyond the issue of just client concerns (i.e. clients engaging in problematic behaviors on social media sites) which is where most of the emphasis on social media is currently situated. 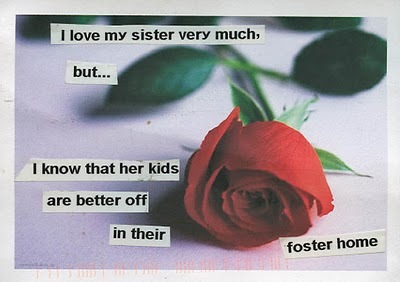 Her sister’s kids might be better of in their foster home, but what a poor standard to use as a measure. I hope these kids find a better situation than that. What are sick days for? Why, to update the blog, of course. My partner is out of town this week, which of course meant that the kids and I would end up getting sick. Isn’t that the way it always is? So sitting here in bed with my laptop (because a grad student is never far away from a laptop and work), working on an article I’m writing with a colleague and a very overdue freelance project, I thought I would pop in and at least pretend to update the blog. I saw “The King’s Speech” last weekend and it made me think about childhood abuse and disabilities. Why adoptive parents who adopted children internationally did not get their children’s citizenship resolved (here, here and here), resulting in adult adoptees whose citizenship is now being questioned if they get into legal trouble and are being deported to their country of birth (despite not having citizenship there either, since citizenship is terminated upon being adopted to the receiving country). This guide from Ethica is aimed towards internationally adopted individuals. I am glad to have my citizenship papers in a secured place. A news story from the UK in which the government is attempting to eliminate consideration of a child’s race and/or ethnicity regarding adoptive placements that sounds similar to the MultiEthnic Placement Act/InterEthnic Provisions here in the U.S. and what that means for the child who will be placed transracially. The use of “advertising” children for adoption, as this blogger discusses. What do the youth themselves think about it? Well, several I have worked with have told me they felt like they were being sold. In my mind, I have a thoughtful, lengthy post for each of these items and more….in reality, this list will have to suffice for now! I’m not a New Year’s Resolution type of person – for many years, as a younger adult, I chose instead to write letters to myself, similar perhaps to the holiday newsletters that people sometimes include in their cards around Christmastime. These letters were retrospective reflections of the past year – the ups and the downs – and thoughts about how I could encourage myself to continue with the things that went well and working towards changing what didn’t work for me. Over the years I would re-read the past year’s letters and reflect on what had (or more often, hadn’t) changed over the years. After having children and getting busier with life, I stopped writing those letters. A year ago, inspired by a friend of mine, I began a new New Year’s tradition – rather than vague goals and a list of tasks or things to do, I choose a word that I want to guide my actions over the coming year. Last year’s word was “intention.” I had been feeling pulled in many directions, feeling like I was bad at saying “no” to things even though with a full-time graduate school schedule, 20 hour a week Research Assistant position, and parenting two teenagers, I didn’t have the time to do everything I was being asked to do on a volunteer basis. Sometimes when you work really hard to get to a point of competency, the push-pull of suddenly being asked to contribute to a lot of things by Important People is both a blessing and a curse. Having a well-known blog and all that came with it certainly added a lot of wonderful things to my life but it also contributed a lot of stress and uncompensated time that often took me away from the things I should have been focusing on instead. So, I chose the word “intention” in order to fill in the sentence “I want to live my life with _______.” Having a guiding word really helped me make some tough decisions. Rather than doing things because I felt obligated, out of guilt, or just because the opportunity was presented to me, I began to ask myself if doing this particular task was an intentional thing or if I was just going with what someone put in front of my face. I ended up cutting out several items from my life and while it was difficult at times, it was absolutely the right thing to do. So as we approached the beginning of 2011, I began reflecting on what I would choose for my guiding word for the year. I decided it would be “compassion.” Compassion for others, of course, but also compassion for myself too. As my family and friends would say, I am often my own worst critic (and I have a pretty sharp tongue). I want my guiding word to help me reflect thoughtfully about the actions I take this year, and think about whether they are compassionate to me and to any other people who are involved. This is not to say that I will be a doormat or let people walk over me; that would not be compassionate to anyone. Rather, since the purpose of compassion is to feel the suffering of others – I am operationalizing “compassion” by thinking of it in terms of trying to think about other people’s perspectives and not jumping to conclusions or taking personally actions of others. Finally, although I don’t typically make “resolutions” I do admit I have a small goal I want to do this year – blog more! I’ve had a good “break” from the time-consuming blogging of my past blog and want to blog more than I have on this blog over the past six months or so. Are you a resolution type of person? Or do you have any other New Year’s goals? I’d love to hear about them! I have a pink copy of this t-shirt that I wear regularly. As you can imagine when I wear it at school, I get smiles and comments such as, “I should get one of those!” When I wear it out in the community, I don’t get such unabashed love but neither do I get the kinds of reactions others have received. Then again, that’s largely because my community is not homogeneous (I’m avoiding the “D” word, as I explain later). 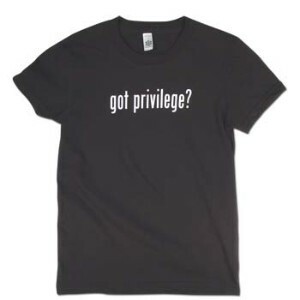 I often find that people are resistant to talking about privilege, especially those who have it and don’t like feeling guilty at real or imagined finger-pointing by those of us who talk a lot about privilege. During our last meeting, I was given a copy of this list of privileges that many of us have. I’m a big fan of Peggy Macintosh and her well-known Knapsack of Privilege, but in many ways I like this one even better. This list created by author John Scalzi really highlights how many privileges we have – even those of us who are not white, male, or middle class. I’m a Korean American woman, and I have many of the privileges so eloquently stated in Scalzi’s blog post. I encourage you to read it for yourself. I’m excited that the white privilege conference is going to be in my home town this year. As promised, here is a link to the Prezi of our presentation at the Council on Social Work Education Annual Program Meeting. Our presentation was about how to use social media – in the classroom (going beyond the closed technologies like Moodle or Web CT); as a recruitment tool for schools of social work, and for individual faculty professional development. One of the things we found out is that while many schools of social work are talking about using social media and have added facebook pages or twitter accounts, that few of them interact with these technologies because they want to – more prevalent was the incorporation of social media because it is the “new thing” or because everyone seems to think organizations have to have a twitter now. But if it’s not used well, then what’s the point?I believe one of the strengths Ericka and I have is our extensive use and knowledge of social media prior to entering the academy. Prezi is a new way of presenting that goes beyond the linear and more static presentation form of powerpoint or keynote. Here is the link to see the presentation for yourself. I believe you will have to sign up for Prezi to be able to make it interactive; if you are a student or educator you can get a free upgraded version but you can also sign up for a basic program and it’s free!. Enjoy! Do you have a favorite social work blog? Go to Active Social Work and send in your nominations! I’ve been blogging now since 2004 but the first years were pretty spotty. Since 2006 I have been regularly blogging with a few breaks in between. I was finishing up my MSW when I began my other blog, and it was a personal blog at first. I was writing about all the things that I cared about – what I was reading, what I was doing in school, my thoughts on my profession, being a parent, what I cooked and ate. It really started to change focus and became directed towards a specific topic (adoption) after I found out that it wasn’t just a few of my close friends who were reading. I have friends who blog, most of them anonymously. But I’m not. People know who I am, where to find me, even though I used a pseudonym. One of the things I’m curious about is the intersection between the personal and professional in a blog. I often read social work blogs but I rarely comment. The faculty at my school and cohort in my doctoral program all know that I blog, some even read it occasionally. When I was working out in the field, my coworkers and supervisors all knew about the blog as well. I tried to maintain the combination of personal and professional with integrity, but it’s hard. But no matter how hard it can be, I think that it’s really beneficial. I know that when I read about the world of others who share my interests and concerns it makes me feel less alone in the world. It also helps provide some larger context. You know how sometimes it seems like you just can’t make sense of something until you see that someone else has struggled with the same thing and you learn from what they have done. I have definitely benefited from that from both the other adoptees who write about adoption, and from other social workers who write about their work. I came across this today, through the Social Work blog. I think it’s such a brilliant idea. I would like to encourage my department to consider something like this, however I don’t think anyone will take it on. It takes a lot of time to blog, I know that. Perhaps it’s because I have been doing it for so long that I don’t see it as being such a burden. I love the idea that this school has a dedicated site for their student bloggers! And wouldn’t it be awesome to have some of the faculty blog as well? My university provides free blog hosting to its faculty and students and at one time I started a blog there. I left it mostly because it was too much work to do the coding even though it is free. Maybe I should reconsider and move this blog there. And get a few of my friends and cohort with me! As a self-described late-bloomer, I “discovered” social work in my mid-thirties. Currently, I am a graduate student working towards a Ph.D. in social work. This blog is a place for me to explore, discover, and basically think aloud about social work – practice issues, research (especially insider/outsider themes), ethics, theory, education and policy and politics. I think a lot about social work history and social work current issues. I question whether this chosen profession is more about social control than social justice. I think a lot about race, power, privilege and the impact “professionalization” has had on the work we do. As a first generation immigrant to the United States, as a person of color, as a feminist, as a former recipient of child welfare and social work services (in two countries), and as a mother, all of these experiences impact my social work perspective. This blog is the place where I will process my thoughts, opinions and feelings about being a social worker and about social work education and about being a future social work researcher and teacher some day. I like to think of this blog as a “sandbox” because it’s a place to explore and discover, not a place to be authoritative and have all the answers. What I’ll be expressing here are my thoughts and ideas and opinions about things. I don’t claim to have all the answers or any of them. Along with that metaphor, I ask that visitors to the sandbox be respectful, play nice with each other, and have the same spirit of discovery and self-reflection. Comments will be moderated to prevent spam and trolls, but will otherwise be published as long as they are respectful to others.